Is the Personal Library Doomed? 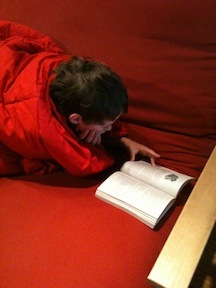 My nephews are both avid readers, a happy coincidence that brings their book aunties much joy. Their house in Burlington is rich in bookcases. They spend summers at the lake, where more bookcases sport ragged, well-loved mysteries and fantasies, Mythbusters and Star Wars books, copies of comics collections like The Order of the Stick, Calvin and Hobbes, all of the Harry Potters. You know, summer staples. When their friends come over, books are readily shared and shown off, shelves pored over, volumes handed between kids like candy bars. Recently, I was lounging on the dock near my nephew Jake and his friend Riley, who were both reading ARCs I’d brought (Super Diaper Baby 2 and Squish). Utterly lost in the companionable habit of reading, they finished their books at exactly the same time and, without a word between them, exchanged books and started reading once again. It was a classic moment and one that made me think, yet again, about the way the reading experience changes with Kindles and Nooks and iPads. Jake, Harry Potter, and a cozy blanket: perfect afternoon. Children, both experienced bookavores and those just learning to read, are SO PROUD of their libraries. “Want to see my books?” they exclaim, leading you by the hand over to the shelves to marvel, especially proud of the sheer number of volumes they have read. There’s something about the physical mounting up of books, the scale of stacks, that cannot be replicated with a gadget. And the thickness of books! Everyone who knows kids knows how Extremely Important a book’s length is, how proud kids are of having waded successfully through all the pages of Inkheart or Harry Potter V. Waving around a Kindle saying, “Look at all the books I’ve … downloaded!” just doesn’t have the same impact as twelve feet of worn spines and pages softened by lingering fingers. The same is true for adults. When new romances are blooming, bookavores spend a lot of time surreptitiously checking out their dates’ bookcases (and, let’s face it, assessing at least their literary compatibility). At dinner parties among new acquaintances, conversations are often sparked by titles—intriguing or familiar—spotted on nearby shelves. It’s the best kind of snooping, poking around other people’s libraries. Our book choices are intimate, revealing, our discoveries meaningful and serendipitous. Looking over someone’s Kindle contents tells me something, but not much. Was this title even read? Has it been re-read, loved, slept with? Read in the bath and therefore slightly waterlogged? Where are the dog-eared pages, the satisfying kinesthetic memory inherent in heft, shape, size? And don’t forget about bookmarks: those tell their own stories. In my own books, I re-discover bookmarks from long-defunct bookshops I loved, receipts and restaurant napkins I used to mark my place that now serve as travel diary entries, photos and other random flat paper items I grabbed to use as placeholders and then left there, giving me sudden bright glimpses of my own forgotten past. And there are items in the pages of books that were left there by other readers, little messages in bottles from across mysterious seas. My sister gave me a beautiful old King James Bible, an ornate leather-bound version from the 1800s, with illustration plates protected by onion skin. Pressed into the heart of the book, between onion skin and paper, was a four-leaf clover. I love this so much I can hardly stand it. A person of faith, perhaps, who owned this book before me, hedged his or her bets with a little piece of pagan luck! Show me an e-reader that can provide that kind of wacky archaeology. The convenience of e-readers is handy, but libraries are treasure troves. I have so many friends and acquaintances who have shifted the bulk of their book buying to e-readers that I am starting to think about more than the usual anxiety about the future of publishing and bookselling. Book fanatics will always be here, and our libraries will survive. But I am starting to wonder whether the casual personal library is in danger. “A guy leading a tour of his home to guests in a room full of emptied built-in bookshelves. On the tabletop of one of the bookcases is a stand with a Kindle on it. Guy is gesturing proudly toward Kindle. Caption: And THIS is my library. And that vision, people, is my nightmare. So, what do you think? Is the casual personal library doomed? And what impact will that have on kids, not to mention our ability to judge potential mates? Inquiring minds (don’t) want to know…. This entry was posted in Uncategorized on August 26, 2011 by Elizabeth Bluemle. We can forecast the development of personal libraries, if we have a look at eating habits. There are people, who will prefer fast food and others, who prefer, enjoy eating in a restaurant or preparing it themselves and who also spend the needed time for it and enjoy it. And others will use both. Somebody, who enjoys to feel a leather bound book in his hands, which is excellently printed, will also spend the money, to buy the books, he really loves. And other books, which he only reads to get the needed information, will be eBooks. And there will will be developped software, with which one can design ones own personal book libray, using beamers, which project large pictures of book shelves onto the walls. And with ebook-manager software, one can collect all eBooks, which one wants to have in ones own personal library. This is fantastic for studying any subject. Search informations, evaluate them, learn from them and apply them. Honestly those few you love get in paper for those you enjoy but don’t sleep with at night electronics can be cost effective, and the younger generation are more likely to be interested in if their in the electronic medium. I don’t think the personal library is doomed. To the contrary, I think personal libraries become more important, and more, well, personal. I’m now much more likely to hang on to my favorite printed books, and I think that propensity will increase as printed books become less common and harder to find (shameful as that is). A personal collection will become something more akin to art or keepsake items that I will want to pass down for generations. I grew up in a house full of books, and have always been a voracious reader. I have packed up my personal library more times than I care to remember, moving from place to place. Last year, on packing up once again, I decided that I had had enough. I spent 3 days going through all of my books, packing up 5 large boxes to donate. I kept the “special” ones–favorite titles, those received as gifts, etc. I am and always will be a reader and a book person, but I no longer feel the need to surround myself with physical evidence that I am such. Anyone who knows me knows that books and reading are a large part of my life. And anyone meeting me for the first time will soon learn the same, despite appearances to the contrary. I’m still a voracious reader–between my public library and my Nook, I have plenty to keep me busy reading every night. And if anyone needs to judge me based on my lack of bookly possessions…well, that’s their problem, not mine. I would dreadfully miss my physical books. I have moved numerous times as an adult. Nine states I think? Some big moves including a move from the Eastern Shore to SoCal. I have winnowed books, but I still have plenty. I have been known to seek a specific book in one of my garage boxes, and an hour later I’m sitting on the stepladder rereading my high school copy of “The Stranger”, especially the notes in the margin. The sought-after title temporarily forgotten. We gave the daughter an Ipad 2 this summer, and she has a reader function on it. But she still requests the physical book most often. I suspect if she downloaded one, and it turned out to be a favorite, I’d be buying a hardcover anyway. BTW- The sought-after title mentioned above? My high school copy of “Lord of the Flies” for my daughter. Turns out she likes my margin notes also. I believe the people that love the feel and perhaps even the smell of the book will always want the physical object. As for personal libraries, I have seen people even today in their early twenties starting to build collections. Personal libraries are not going anywhere. Those who read and collect will continue to do so and others will follow the trend. Huh. I left a comment yesterday but it didn’t show up. Maybe a Kindle hacked into a network somewhere and deleted me 😉 I’ll keep it brief: I love physical books and there are some I will always have with me. OK, many. I disagree with the respondents who say they are just ‘possessions’ and objects piling up or that it is merely ‘sentimental’ to keep books or to hold them in high regard. Nor do I think libraries and bookstores are modern day barrel makers (an absurd comparison). That said, I think there is plenty of room for both books and ebooks. My house is crammed with books. I use them frequently in my work and for my pleasure. There is information in them that I cannot find on the Internet, anywhere. I also use the Internet extensively and appreciate the speed with which I can use an online encyclopedia or gov’t resources etc. to look up a fact. If I had a Kindle, I’m sure that I would relegate certain kinds of materials to that device while still keeping my books. There would just be more of the thing I love best: reading. I agree with your comments. I have books in every room, and know just where to go to pull a particular one out. I use libraries as a place to read books that I will not be adding to my collection. When I get a NOOK, I will use it to download obscure books referenced in my readings, that I won’t be adding to my personal shelves. I do not anticipate going to bed with a Nook. We lived in and loved our house for 42 years. Then moved and sold the house. When it went up for sale again we went to the open-house-showing. Very nice. But no books, no book shelves. Guess what? I felt sorry for the HOUSE! One immediate measure that should be taken is to begin selling paper copies (at least hardcover and trade paper, but ideally everything) with access to a free digital download of the book. This will require adjustment to publishing agreements and perhaps distribution centers. Those who want to continue supporting paper copies and building their libraries should have the opportunity to enjoy digital conveniences as well, without paying double for the title. This will perpetuate the market for print. It’s being done with vinyl LP music (many of which come with an MP3 download code). It can be done with books. It must be. Involved parties need to think beyond their historical models and to not become blinded by paranoia or greed. Preserve paper publishing – bundle with digital. Hmm I agree and disagree. Love my I pad. I love my books too. However it is easy for me to find what I enjoy reading using my pad. I get immersed in my reading and very soon the pad or book seems the same. Change will happen, it is not to fear it but to see how and what we can enjoy from it. It is not for all. But to have a library at my finger tips is awesome. Love it….. I feel like we’re going back in history at the same time we’re moving forward! Books used to be rare and libraries in homes didn’t really start until the Victorian era. As a librarian, I don’t fear books going away, because they’re not – they are just moving to a new format – and libraries have been through that many times. Bill Dority has read a thousand books? How limiting. Even worse he re-reads some of them. And he thinks he can access any book he wants on-line? Rubbish: can he read James Bond online? Or almost any book that is not out of copyright? Maybe he means he wants to read only those books that are currently available on-line. Again, how limiting. I’m suspicious of anyone who doesn’t have books in their house. Just because a book is on someones e-reader doesn’t mean its ever been read. That’s why perusing a persons bookshelves tells so much more-the one bought but never read or the one falling apart having been read so much. Thank you for this article. It expresses the fears I have been carrying around since the independent bookstores started disappearing in large numbers. The cartoon is a vivid warning of what might occur if we don’t wake up and start supporting bookstore owners and attending book fairs. I am grateful to have a fairly large personal library, and I have no intention of getting rid of my books or ever buying a Kindle. Perish the thought! I’m in the minority, I think. I don’t measure my life by personal possessions. Every physical book I own is one more thing I’ve got to find a place to store. If I were into Feng Shui, I’d probably be even more anti-book (massive amounts of dead stuff in the house blocking the flow of qi?). 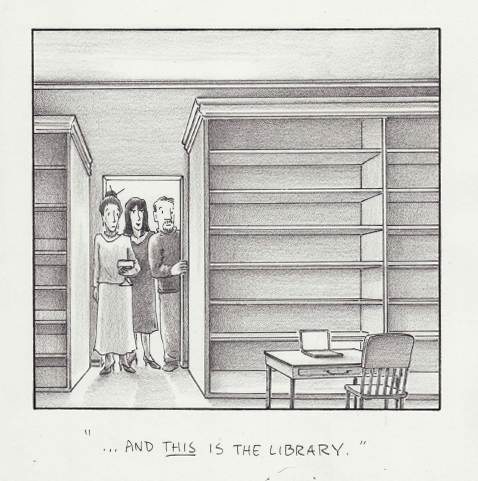 I can’t afford a home large enough to hold an actual library — ref George Carlin’s famous “stuff” monologue. Moving a large collection of books from one home to another is a pain. So there are very few books that I’ve chosen to keep. As for evaluating other people by their book collections, I’ve never done that in my life. There are plenty of Web sites where you can publicly post your book collections for others to see if that’s what you want. Fun cartoon. Harry Bliss did a great job. Yes! Absolutely without question the personal library is doomed. Your kids (and their kids) will grow up for the most part without the attachment to physical books that you have, and probably understanding better than you the advantages of ebooks. They will not be so sentimental. Physical books and libraries as we now know them are the new barrel makers (milk deliverymen; caboose attendants; and horse drawn carriage makers). Love ebooks or hate them they are fundamentally changing our culture. What shops DIDN’T those who rioted in Britain loot? Booksellers. That ought to tell you something. I love reading, but my books are slowly going away. I’d rather carry my library in my pocket. I gotta play devil’s advocate for a minute…one benefit of the e-reader library is that you don’t have to be in someone’s home to get an intimate glance at her life through the books she has read. I think you miss out on a lot (I’m still a print book snob) but I’ve had a few instances where I’ve learned more about someone by looking at their e-reader. And these are probably people that I will never visit in their homes. I love a room filled with books. Ultimately, though, I adore books for their contents, and digitization is heightening the reading experience for me. I’m happy to have access to an entire library in my bag. I love the iBook dictionary, search, highlight, and comment features. And I look forward to the day when kids can carry one device rather than several heavy textbooks in their backpacks. Maybe we won’t be able to judge a person by her physical library much longer. As long as there’s no excellent reader for (traditional, un-enhanced) picture books, we can retain the hope that children will develop the same deep attachment to physical books as we have. My concern is that as soon as PB’s can be shared beautifully electronically, book-lovers will become the Luddites of a new generation and the bookshelf will go the way of the giant, early 20th century radio. I have a few tremors of fear but not an earthquake of anxiety (yet) about this issue. I still see kids checking out armloads of books from the library; our local indy shops so far are doing OK, and plenty of people still head off to the right and the left in the big Barnes & Noble here as they swerve around the Nook kiosk like waves hitting a rock. Most readers I speak to seem to indicate that they’re happy with a world in which both books and Nooks etc. exist. Most people I’ve overheard who brag about ditching their library for a Kindle seem primarily to be engaged in one of those spittin’ contests for who’s got the newest version of an electronic gadget of any sort. I understand this fear, but I don’t currently share it. I’ve been a bookseller for 13 years. I have an e-reader, and while I appreciate and enjoy it’s convenience, it hasn’t replaced paper books. My hope is that, with improving printing technology, we will one day be able to print any book we want, with whatever cover we want. How cool would it be to have your own personally designed cover of your favorite novel? LOVE THIS! Your fears are my fears. The first thing I do when I go to someone’s house is browse through their books… and if they don’t have any, I run the other way. The books shelved throughout our house are basically what serve as our decor… Can’t imagine the place without them.